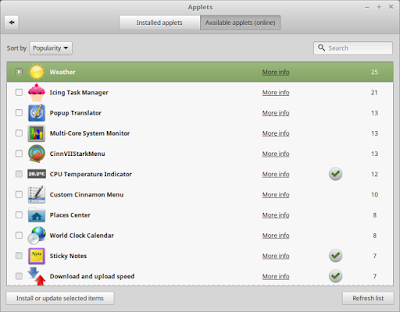 This article is a simple list for interesting Cinnamon applets. You see here how to install applet, and then CPU Temperature Indicator, Pomodoro, Internet Search Engine, Net speed indicator, Record Desktop (screencaster, like Kazam), Sticky Notes, and Stopwatch. I hope this list helps you find your needs and ease your daily life. To install any applet, right-click on panel > Add applets to panel > go to tab Available applets (online) > select applet > press Install or update selected items > go to tab Installed applets > select the installed applet > Add to panel. Note that applet installation this way needs internet access. 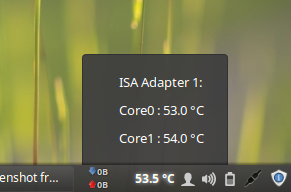 This applet shows a real-time CPU temperature on your panel. So, you can always know where you should give your computer some extra cooling. Pomodoro is a timing technique to enhance concentration, to help finish tasks efficiently. Now you can get Pomodoro Timer on your Cinnamon desktop. You can place Google Search, Yahoo!, or DuckDuckGo applet right on your panel. With this, you can search anything anytime and when you press Enter it runs web browser with the result you want. You can find its name Internet Search Box on applets installer. Do you remember Netspeed on GNOME? This applet is the same thing for Cinnamon. It shows real-time upload & download speed with total transfer per day via tooltip. 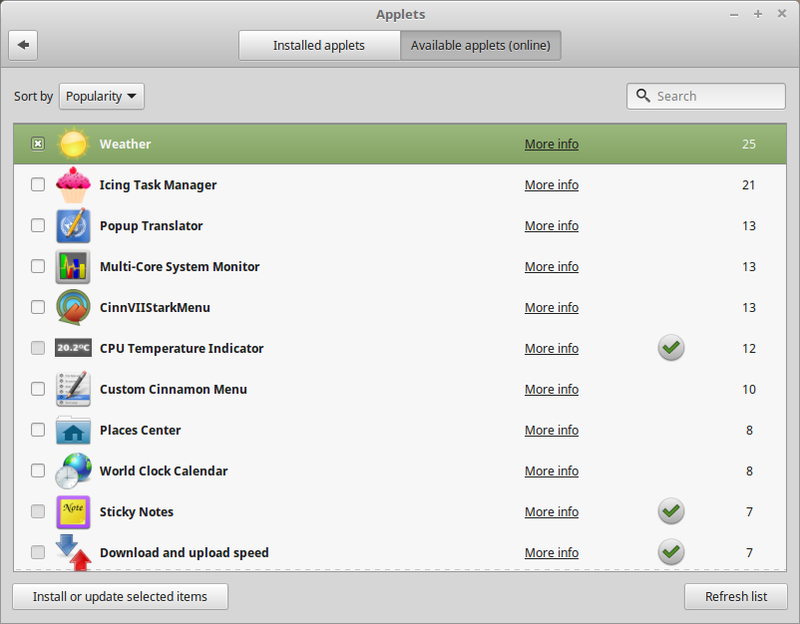 Personally, this applet is always the first to install for me every time I installed Mint Cinnamon. If you want colorful sticky notes, with task list feature, or simply Sticky Notes widget replacement for KDE, Sticky Notes on Cinnamon is the solution. Again, do you remember EasyScreencast on GNOME? 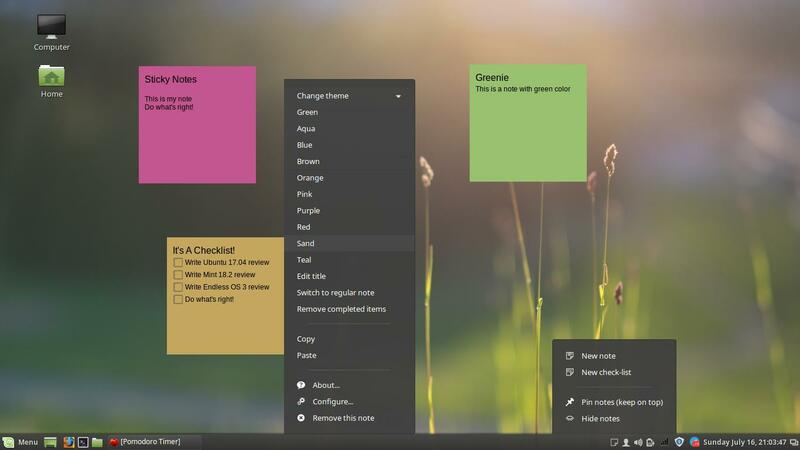 This ScreenShot+Record Desktop is the replacement on Cinnamon. 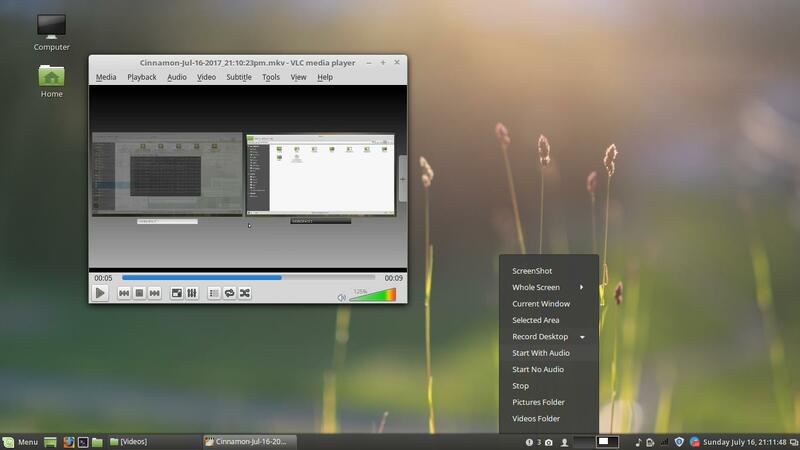 You can take screenshot to image, you can also record screen activities as video (MKV format) with or without sound input. 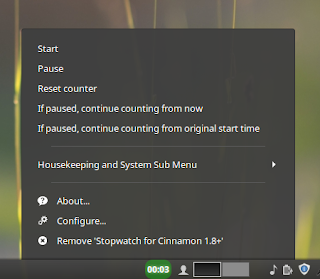 If you need a stopwatch on desktop, use Stopwatch for Cinnamon 1.8+ applet. You'll have a simple time counter on panel you can stop at anytime.